“Growing those crystals in the lab is much more tricky than I thought”, Nickie Messini says. “But I really like it as much as the computational analysis for structure refinement!” The young bachelor student from University of Patras, Greece, has already produced some tiny crystals of the protein Endothiapepsin at the MX lab for protein crystallography at BESSY II. It is not easy to force those large Endothiapepsin molecules into the rigid order of a crystal, but Nickie knows how to achieve it. Endothiapepsin crystals are ideally suited as a model system to facilitate the search for new drugs by a method called fragment screening. At the MX-Beamline at BESSY II, Nickie is already analyzing her newly produced crystals. At the University of Patras, Nickie was working in a biophysics lab on her bachelor. Her experiments involved organic crystals as well, built from the protein insulin and an antioxidant, which happens to play a role in plants: a polyphenol. Combining insulin with polyphenol could open up a new therapy for diabetes patients: “The long term goal is to develop a method to retard the delivery of insulin in the human body”, Nickie explains. This would allow to inject insulin only once a day (or a week) instead of every time before a meal. A big step towards more comfort and safety for many patients. 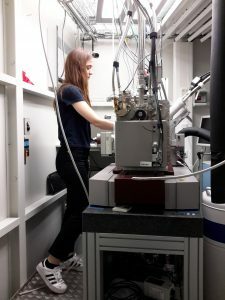 Nickie can analyse her crystals at the MX-Beamline. Nickie wanted to add something really valuable to her bachelor work and got aware of the multiple ERASMUS programmes for students in European countries. Soon she found the MX group in Berlin to be the perfect place and contacted group leader Dr. Manfred Weiss. He replied quickly and she decided to come – and was then quite happy to pass the strict ERASMUS selection procedures. Since May 2018 she is in Berlin now. With an ERASMUS traineeship of the European Union, she can stay three months. In these three months, Nickie is involved in the big MX-project on fragment screening. In a nutshell explained, fragment screening is helpful to accelerate the search for efficient drugs. For analyzing every possible candidate molecule and inquiring how it binds to a specific target or receptor is incredibly long – it means finding a needle in a big heap of straw. In fragment screening, only tiny fragments or building blocks of those candidates are tested. And if a fragment is identified, which binds well to a specific receptor, it can be used as a starting point to design a drug. As her supervisor Jan Wollenhaupt puts it: “The big advantage of fragment screening is that you know the 3D structure of your fragment bound to the receptor and you can use this knowledge for your follow-up compound design. That is why we at BESSY II offer fragment screening to the scientific community and in parallel we improve the methodology“. In the lab, the Endothiapepsin crystals are soaked with different fragments and then analysed at BESSY II. 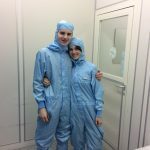 “I am not only learning here to do protein crystallography but I can even contribute to the HZB project and help improving the methodology”, Nickie says.